Fig. 2—Changes in production shutdown time for breaks can change product status. Fig. 3—Changes of production operators can bring major changes in product severity. Fig. 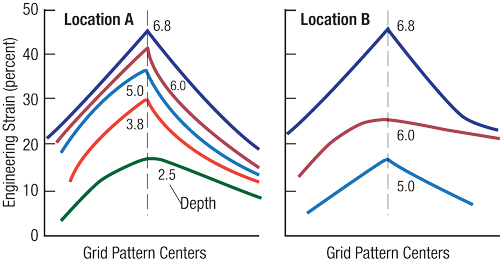 4—Location A has a continuous deformation from start to maximum. Location B concentrates all deformation in the last 2 in. Assume you are taking a long car trip. You fill up the gas tank, check the oil level, top off the washer fluid and antifreeze, etc. Your calculations say you have enough fluids, and you are set to go. However, your car is different—it has no gauges to provide information on how the car is functioning during the trip. Would you take such a trip? The same problem can occur during metalforming. You are given the yield strength, tensile strength, total elongation and thickness of the material. You cut the sheet into blanks, feed directly from a coil or create other shapes to place into the press, add lubricant, set press speed and force, etc., and create the part. Do you know what is happening during the forming process? Cars have gauges to obtain ongoing process information. Press shops offer the same opportunity. Here are some possible problem scenarios and the process information for solving them. Problem: Parts exit the press varying in shape relative to the print. Is the damage caused by the material or by the forming process? 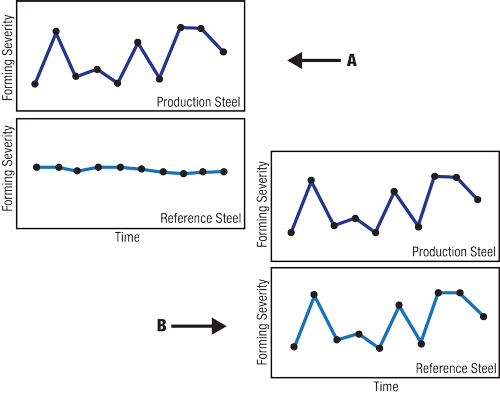 This can be solved by forming five pieces of production steel and then forming five parts from a reference steel (Fig. 1). If the production steel has a high variability of forming severity, and the reference steel has a stable forming severity, the problem is with the production steel. If both the production steel and reference steel have similar patterns and degree of forming severity, the problem is the forming process. Problem: The stamping has differing severity levels throughout the day (Fig. 2). The variation is the temperature of the parts; if part temperature consistently climbs at the same rate, a control system can be added. However, the production has a shutdown for lunch at 4 hours into the shift, and mid-shift reliefs at 2 and 6 hours. 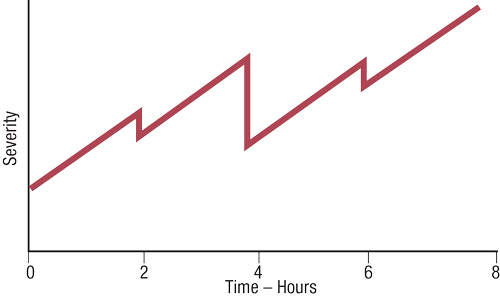 The timing and duration of shutdowns can change depending on maintenance, discussions, stocking blanks, etc. 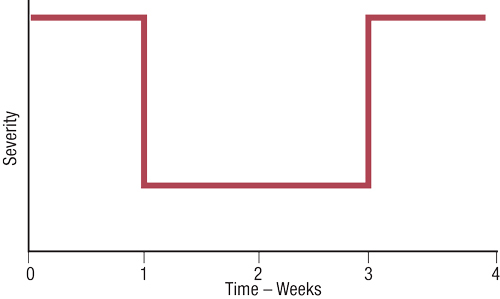 Problem: After one week during summer, the high severity variation of the parts drops to a low number (Fig. 3). After two weeks the high severity returns. A study of the problem shows that the usual operator for this press took vacation for those two weeks. The operator was known for constantly changing the settings of the press. During his vacation the press was set once at the start of production, and the settings were not touched until his return. Problem: Two different areas on the same stamping have the same final strain distribution/gradient (Fig. 4). However, Area A is stable and does not experience breakage. Area B is unstable and always encounters severe breakage. The forming process in Area B must be changed.